Not everyone lucks out with neighbors, but we really did. When the house next door went up for sale, we began elaborate plans for a fence to insure our privacy. Thankfully, technical difficulties stalled our progress. Once the new owners moved in we knew we were lucky: two great kids, plus friendly parents who love food and gardening, inspired us cut a hole in our hedge so we can say hello or share some fresh herbs with ease. These wonderful next-door neighbors had us over for an Indian feast a few months ago. They made delicious fresh dosa and an incredible dal. With every bite, I savored the subtle and surprising coconut flavor that permeated the dish. After I got their recipe, I immediately made a big pot of dal and relished eating it for many lunches with rice and steamed winter greens. 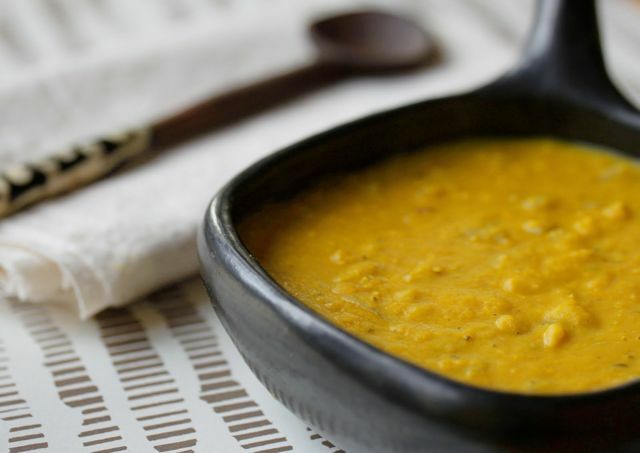 Cook lentils in water or stock with salt and 1 teaspoon turmeric. When peas are tender, drain, but keep cooking liquid and set aside. Saute onions with veg oil, garlic, cumin, 1 teaspoon turmeric, pepper, and chilis, until onions are golden. Stir constantly. 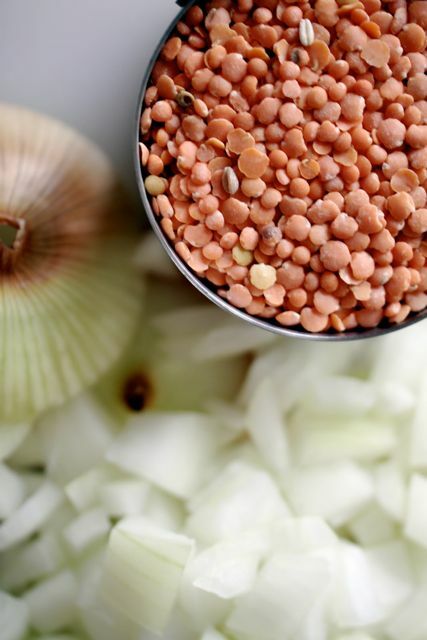 Mix onions with cooked lentils and reheat slowly. Then add coconut milk. Stir and warm all ingredients. Add some reserved cooking liquid if the dal is too dry or thick. It's funny how, over the years, dal has become one of my comfort foods. Nothing like warming Indian spices to nourish me on a cold winter's evening. Amen to dal -- and wonderful neighbors. I love dal. In any way, and with any accompaniment. Love. Dal. Oh I love dal, I will definitely be making this, this week! I think I am gonna have to make another batch myself! Any idea if this freezes well? Thanks! Hmmm....Good question, M. I have never tried freezing the dal because we devour it so quickly. But I love the idea of having a stash in the freezer for an easy meal. If you do try freezing it, I'd love to know how it goes. This was divine! I accidentally scooped up split peas and it was too late to toss them so I used them in place of the lentils and omitted the turmeric. Soooo yummy on a cooler day in NY like it is now. I also used an immersion blender at the end. Hey Melissa, I bet the split peas were great. I am a big fan. And a pureed finish sounds wonderful! Hi, Yes you can freeze daal.I use about half the water when making it so when I reheat it I can add water or coconut milk and fresh corriander. Maureen, I'm guessing a version of the recipe would work in a crockpot, though I can't say with authority... Believe it or not...I don't own one.